With ability to deliver 0.04ÂºC/w in 320 x 160 mm footprint, model HS-004 suits applications in high power IGBTs, power converter modules, and high power laser sources. It is available with 5 high power fans, fan duct, and terminal block, facilitating power supply connection. Other features include segmented high density fins to break down laminar flow layers periodically along flow path to increase turbulence. Elite Thermal Engineering, a leading supplier for engineering thermal solutions, released a compact high performance fan/heatsink assembly with six embedded heatpipes, model# HS-004. 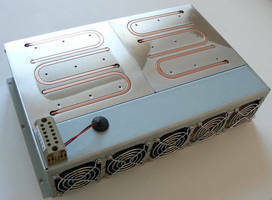 The heatsinks in the same class on the market are much larger and less effective. Elite's HS-004 combines state-of-the-art forging technology and heatpipe technology to deliver 0.04ºC/w in a compact 320mm x 160mm footprint. Forged fins have the lowest thermal resistance between the fins and the base, and provide higher fin density than conventional process; the six embedded heatpipes are the most effective heat spreader for high power high heatflux heat sources. Low spreading resistance and compact size make HS-004 an ideal choice for high power IGBTs, power converter modules and high power laser sources. HS-004 also has segmented high density fins that break down laminar flow layers periodically along the flow path to increase turbulence. Higher turbulence improves fin efficiency. HS-004 comes with five high power fans, a fan duct and a terminal block for easy connection to power supplies.